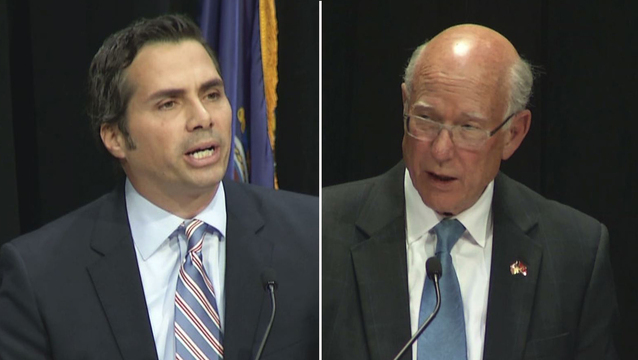 The two words Republican Sen. Pat Roberts wanted Kansans to remember from his Wednesday night debate against Greg Orman were "liberal Democrat." "Kansans know they have a choice to make. They can make a choice between a trusted conservative Republican with integrity or my opponent, who is a liberal Democrat who still wont shoot straight," Roberts, who's running for his fourth term, said at the outset of the debate. Faced with an unexpectedly robust challenge from Orman, a businessman running as an independent, Roberts is doing everything he can to convince voters that Orman isn't really an independent by tying him to President Obama and Senate Majority Leader Harry Reid, D-Nevada. Only a vote in his favor would result in a Republican majority, he argued. "[Orman] ran against me as a Democrat in 2008 and he gave contributions, $174,000 to Hillary Clinton, to Barack Obama, and yes, even Harry Reid," Roberts said. "By deed and by word and by campaign contribution he cannot stand up to the Reid-Obama agenda." Which party would get Kansas independent Greg Orman's vote? That's the argument Roberts has made for weeks, although Orman hasn't made it easy to prove: he refuses to say which party he would caucus with if elected to the Senate, and says that both parties are responsible for the gridlock in Washington. But he did accuse Roberts of "making up facts" about his political donations. "Tonight, Senator Roberts is going to tell you that President Obama and Harry Reid are the reason Washington's such a mess and you know what? He's half right," Orman said before Roberts even launched the first attack. "But the other half of the mess: [Senate Minority Leader] Mitch McConnell and Pat Roberts. The truth is both parties are more interested in playing games than solving problems and both parties are failing Kansas. That's why I'm running for the U.S. Senate as an independent." Roberts kept his focus on the issue the entire debate, using his closing remarks to say that Orman was set to attend a fundraiser in New York with the family of liberal billionaire George Soros where he'll receive an endorsement from the AFL-CIO. "I have never known the Soros family to endorse independents. They endorse liberal Democrats and so does the AFL-CIO," he said. During the rest of the hour-long debate, the moderators quizzed the candidates about their positions on issues ranging from farm policy to the Ebola outbreak to immigration. "I believe our policy on immigration needs to be tough, practical and fair," Orman said, describing the outlines of a plan passed with bipartisan support in the Senate last summer. To deport 11.5 million people would not be economically advisable, he said, citing industries in Kansas that would be "decimated" by such a policy. Instead, Orman said he would have immigrants in the U.S. illegally register with the government, pay a fine or perform community service, hold down a job, pay taxes and obey laws in order to stay. Roberts repeated over and over again the importance of border security, mentioning it in the same breath as Ebola and the Islamic State of Iraq and Syria (ISIS) to suggest the U.S. is vulnerable to more than just illegal immigration. He also said, "you're not going to get any immigration policy as long as Harry Reid is the majority leader of the Senate. He uses immigration as a political tool." Mr. Obama, he warned, planned to "declare amnesty for illegal aliens" by executive order and said the president would be backed by Orman. "I do not support amnesty," Orman responded. They also sparred over abortion, which Orman said "prevents us from talking about other important issues." "What I'd like to see us do is start focusing on the big problems that we absolutely need to get our arms around," he said. Roberts called his words "unconscionable." "Get past the rights of the unborn? Get past the guarantee of life for those at the end of life?" Roberts asked. "I think that's unconscionable, Greg, I really do." In a rare moment of agreement, both candidates said they would suspend air travel between the U.S. and West Africa as a way to stop more Ebola cases from coming to the U.S. But Orman accused Roberts of "inappropriate" tough talk against Ebola because he skipped a hearing on the crisis when he was in Washington last month. "The hearing was held out session," Roberts said. "Nothing of substance came of it."